SignMyCar! 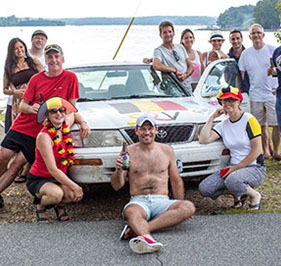 Belgian Storytelling Tour is an interactive online documentary focusing on Belgians living in the United States. I go live with Belgians in every American states to document their lives. Participants share their stories and sign my car! Their signatures are digitized, enabling viewers to either scan a signature on the car with a smartphone (or click on it online) to discover the life story behind it. SignMyCar!’s innovative journalism blends participatory art and multimedia to create an intercultural dialogue. 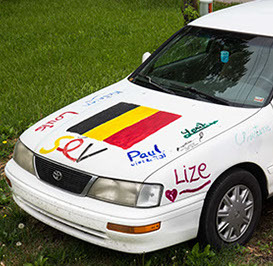 Through the eyes of the Belgian American Community, SignMyCar! talks about immigration. It tackles the joys and the challenges of leaving your homeland to reinvent yourself somewhere new. The SignMyCar! Tour has already traveled over 18,000 miles / 29.000 km across 18 states since 2014. It will be stopping in each of the 48 continental states. Help us continue by contributing to our GoFundMe Campaign or by becoming a sponsor! Discover the stories behind each signature! This section will take you to the storytelling car! Click on any signature to discover the story behind them. SignMyCar! 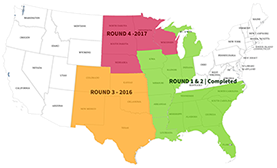 started in 2014 and is produced by legs called "Rounds". Find out when the storytelling car will be near you!